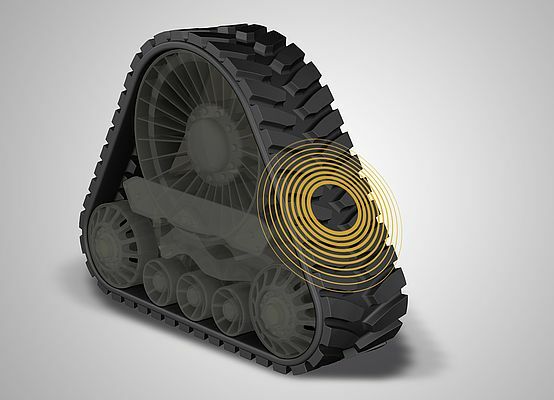 Rubber tracks with sensor technology are among Continental’s latest technologies. This technology allows the carcass temperature of the rubber tracks to be measured and monitored during use on vehicles. Targeted monitoring of this kind helps operators of agricultural vehicles to extend the service life and efficiency of these components and helps avoid repair costs. If something becomes critical, the driver receives a corresponding warning on a display in the driver’s cab. This is particularly beneficial when traveling on asphalt roads, as the rubber tracks are particularly susceptible to wear on this surface. With the intelligent rubber tracks, drivers always have an overview of the temperature and can tailor their speed as effectively as possible. This allows them to get a longer service life out of the rubber tracks without having to reduce their speed. Another advantage is that preventive maintenance ensures that action can be taken before a defect actually occurs.